In short, to provide veterinary expertise to the Pine Marten Recovery Project in 2017. In the Autumn of 2015 and 2016, WVI's vets Dr John Lewis and Dr Alex Tomlinson added the veterinary bit to the translocation plan. This resulted in 20 pine martens being successfully translocated (moved) in 2015 and a further 19 this Autumn. Last spring there were signs of several translocated females having and rearing kits, demonstrating that the move from Scotland didn't interrupt their breeding behaviours. A key part of any good translocation programme (including reintroductions) is the post-release monitoring. The Team, lead by Vincent Wildlife Trust, will be monitoring the pine martens over the next few years answering questions such as how are managing in a new environment, how many die, what of, if they move, where to, what are they eating etc. Part of this monitoring is collecting samples that we will get screened for a number of diseases. The results will be compared with results from previous years and what we predicted. Outcomes will be fed back in to the project to help direct ways forward. What is this all about?? The Big Give have set up a fundraising event (called the #ChristmasChallenge16) for all charities to take part in. Earlier this year, WVI successfully applied to The Big Give to take part in the challenge and for match funding. WVI chose to raise funds for our pine marten project activities in 2017 and as part of this application we had to find some of our own match funding. We are very grateful to Virbac UK, Pet-ID and some private funders for putting up some match funding. SUCCESS - in early October we found out that The Reed Foundation had agreed to provide further match funding, through The Big Give. All WVI needs to do now is to raise £3,000 in online donations between midday on 29th November (#GivingTuesday) and Friday 2nd December. If we manage we will get all the pledged match funding and be in with a chance of winning further funding awarded to successful challengers..... Clear as mud? Please follow us on Twitter, Facebook and Google+ and sign up to our newsletter. Please like, share or retweet everything that we post and please tell as many people as you can about us. 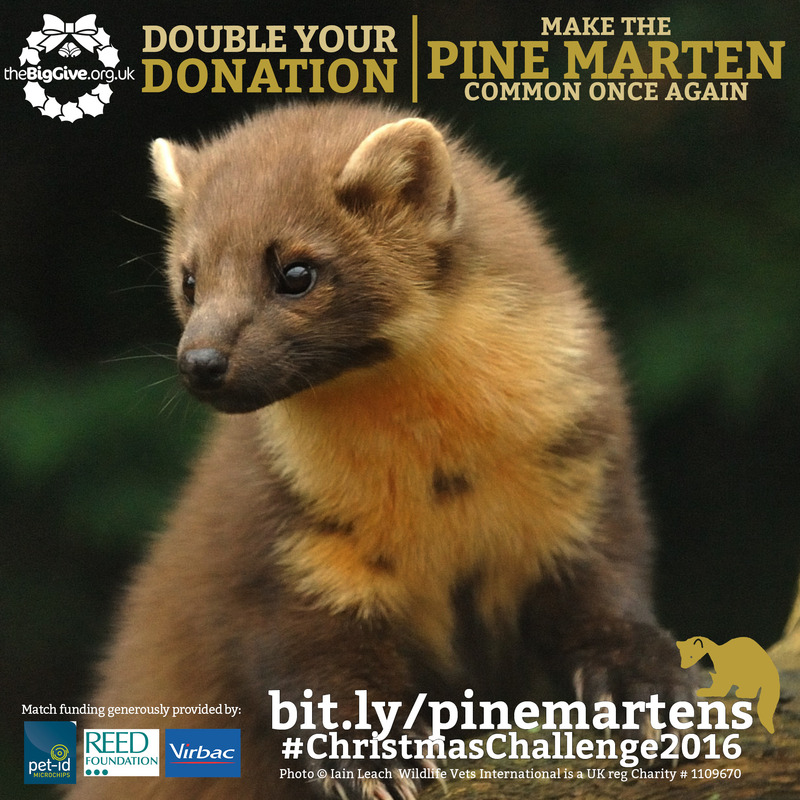 Please sell cakes (see Pine Marten Munchies for an idea), walk miles, wade through mud etc to raise funds that you can give us online during #ChristmasChallenge16. Donate through The Big Give between 29th Nov and 2nd Dec to #doubleyourdonation - all currencies welcome!